Offering you a complete choice of products which include solvent based inks for hdpe, solvent based inks for ldpe, solvent based inks for flexo machine and plastic carry bags solvent based inks. We are one of the leading manufacturers, suppliers, and exporters of Solvent Based Inks For HDPE. The offered solvent-based inks are very suitable for printing on materials such as polyester, cellophane, and polypropylene. 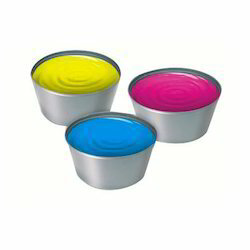 Our supplied solvent-based inks are capable of rendering very clear and fine dots, in printing. The manufactured solvent-based inks are known for imparting glowing finish and shine, on the applied surfaces. 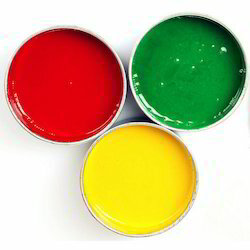 Our supplied solvent-based inks are resistive to mild heat and temperature. These Inks find an application on polyester, treated BOPP, treated polyethylene, polypropylene, board and paper, aluminum foil etc. These diverse applications are available in full range of shades. These Inks have High Gloss and Excellent Printability, Besides Polythene, these can also be used on other subsets like Cellophane (PT & MST), Polypropylene (Treated), PVC. These Inks are suitable for Polyester, having High Quality & Maximum Pigmentation resulting in maximum Mileage and very clear fine dots in printing. The net result is that output gets Glow Finish and Excellent Gloss. These Inks are recommended for Metalised Surface. They are based on pigments and Dyes. Dye-based Inks give Superior Gloss, enhanced print sharpness, and Sheen. These Inks are Heat Resistant and are used extensively for packaging of confectionery items. These inks are suitable for Metalized Surface. These Inks are again based on both Pigments and Dyes. Dye-based inks have sharper and finer print results. These Inks are used on Foil, Blister and Glassine Paper, mainly for Pharmaceutical Products. These Inks have Good Gloss and are Heat Resistant. we are offering Solvent Based Inks For LDPE to our client. We are offering Solvent Based Inks For Flexo Machine to our client. We are one of the leading manufacturers and exporters of Plastic Carry Bags Solvent Based Inks. The offered solvent-based inks are very suitable for printing on materials such as polyester, cellophane, and polypropylene. 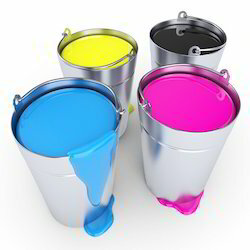 Our supplied solvent-based inks are capable of rendering very clear and fine dots, in printing. The manufactured solvent-based inks are known for imparting glowing finish and shine, on the applied surfaces. 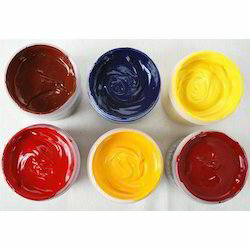 Our supplied solvent-based inks are resistive to mild heat and temperature. Looking for Solvent Based Inks ?